Lakes come in all shapes and sizes, and some of them are certainly notable for their size, depth, or other characteristics. A lake is different from a pond, sea, ocean, river or lagoon. A lake is defined as a large water area that has exposed land on all sides. Lakes are typically freshwater, but there are some cases where they can be filled with salt water. Lakes are usually less shallow than seas and oceans. Lakes tend to host many different forms of life including plants, fish, and other animals. 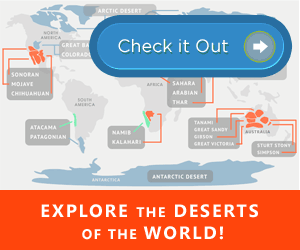 Read on to explore the largest lakes of the world, the deepest lake in the world, the clearest lake in the world and even the highest lake in the world. 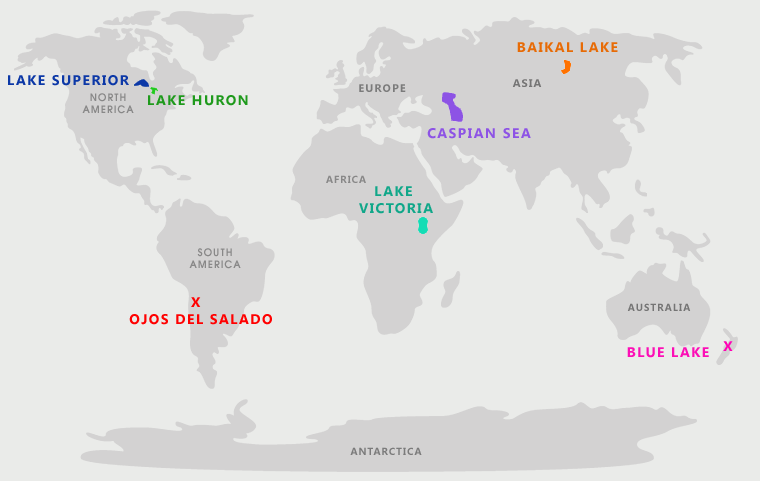 If you’ve ever wondered about which lakes are most notable, these are some of the largest lakes in the world today. Their ranking is actually determined by area so although they may not always have been the widest in diameter, their total water area determines the ranking. This sea is often regarded as the largest lake in the world with 143,000 square miles. However, since it contains an oceanic basin rather than just being entirely over a continental crust, it’s considered an oceanic lake. Unlike the continental lakes on this list, the Caspian Sea is considered an anomaly when it comes to lakes. It actually has no outflows and is bordered by the countries of Kazakhstan, Russia, Iran, Azerbaijan, and Turkmenistan. One of the great lakes, Lake Superior measures in at 31,820 square miles. It’s bounded by both Canada and the United States and makes up one of five. The native Ojibwe actually named it gichigami, meaning that it was a “great sea.” Henry Wadsworth Longfellow also found Lake Superior to be notable and wrote about it in his famous work “The Song of Hiawatha.” Unlike the Caspian Sea, Lake Superior is fed by over 200 rivers and drains into Lake Huron. Additionally, there are several islands in this lake. The largest is Isle Royale, a national park, that draws visitors from around the world. This lake is one of the African Great Lakes and, as its name suggests, was named after Queen Victoria by the explorer John Speke. He was the first European to discover the lake and, impressed by its size, named it after the queen in 1858 while on an expedition to locate the source of the Nile River. This lake has an area of 26,600 square miles and is the largest tropical lake in the world. Surrounded by Kenya, Uganda, and Tanzania, Lake Victoria is actually only 276 feet deep. The lake is located in a shallow depression and receives water from thousands of small streams as well as directly from precipitation. Lake Huron is the second largest lake in the Great Lakes and the fourth largest in the world. With an area of 23,000 square miles, it also contains the world’s largest lake island, Manitoulin Island. However, while notable, Huron contains approximately 30,000 islands in total. This lake was named by early French explorers who named it for the Huron people who inhabited the region. The primary inlet for Lake Huron is St Mary’s River and the main outlet is the St. Clair. Like the other Great Lakes, Huron was originally formed by melting ice as glaciers began to retreat at the end of the ice age. Before it was a lake, the area it occupies was a low-lying depression buried lakes flowed through. Many of the channels can still be seen today. Although most people wouldn’t think about lakes or much else in Siberia, this country can actually boast having the world’s deepest lake in the world. Lake Baikal located in the south of Russia is approximated to be 5,314 feet deep. It’s certainly difficult to understand how a lake in the middle of a continent could have a bottom that’s 4,215 feet below sea level. It’s actually impossible for erosion to have caused a channel that deep. The reason for its depth is because the lake is located in an active continental rift zone. The rift zone still widens approximately one inch every year. And, as the rift grows wider, it actually grows deeper so it may actually be difficult to know the depth in the future. The world took a closer look at New Zealand after the famous Lord of the Rings films were made in their small country. Famous for its scenic landscapes, New Zealand can claim another prize as well: the clearest lake in the world. The Blue Lake is actually the simple name for this body of water which may also be called Rotomairewhenau. It’s located in Nelson Lakes National Park and research carried out by the National Institute of Water and Atmospheric Research showed that the Blue Lake is the clearest natural body of water that’s known to man today. To give you an idea of how clear, you can see up to 80 meters or 262 feet in the water. This means that it’s almost as optically clear as distilled water. Because of this achievement, people travel from around the world to get a look at the lake. Another interesting fact is that the Blue Lake is characterized by blue-violet hues that can only be seen in lakes with clear, natural water. The highest body of water in the world is actually located in Nevada Ojos del Salado, Argentina. For a lake with this achievement, you’d expect something impressive, right? While the altitude of 6,390 m above sea level certainly is, the lake itself is another matter. It’s a small crater lake with only a 100-meter diameter and a depth of 10 meters. Located on top of a volcano known as Ojos del Salado, or “The Eyes of Salty Water,” this volcano is the highest on earth and not entirely dormant. Tourists can actually visit the lake and may choose to climb it, although this is an achievement that’s typically only undertaken by more experienced climbers. However, while the lake may not be very impressive, the view from the top certainly is! These lakes of the world are amazing geological achievements and can be found in a variety of locations across the globe. Each was formed in a unique way. While some were simply the top of a volcano, others were formed from significant global changes over time. However, no matter their origins, each of these lakes is notable for their unique features. When you look through this listing, it’s no small surprise that people travel the seven continents to view these lakes and experience them first-hand!